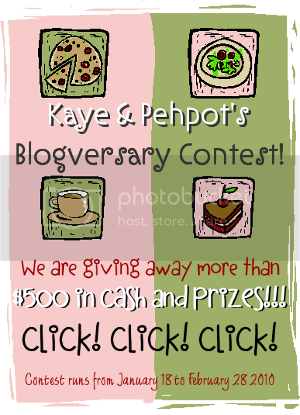 Just About Anything: The Biggest Blogging Contest Is UP! There's a big kind of BUZZ going on in the "blogniverse". If you don't know all about it, then you are missing something BIG... something like $500.00 in total cash and prizes! And because the prizes are so YUMMY, I am taking the liberty of joining too. I almost nailed it the last time I joined a big contest and I vow to really make it this time. The MASTERMINDS behind this YUMMY contest? The wonderful ladies who write the equally wonderful blogs Make or Break and Random WAHM Thoughts, none other than Marce Pehpot and Marce Kaye. So what are you waiting for? Take some time in front of the PC writing up those reviews. There's still plenty of time. Contest ends on February 28th. I wish everyone the best of luck! God bless you! :) have a great weekend! Thanks for blogging about the contest and reviewing the major sponsors. You are now qualified to the biggest contest on blogniverse. Hurry and GAIN MORE POINTS and have the chance to bag the first prize $200.